The new building at the FIZ Research and Innovation Centre in Munich’s Milbertshofen district provides unique possibilities for virtual testing of advanced driving assistance systems and innovative display and control concepts. This will, above all, strengthen the development expertise of the BMW Group in the field of autonomous driving. 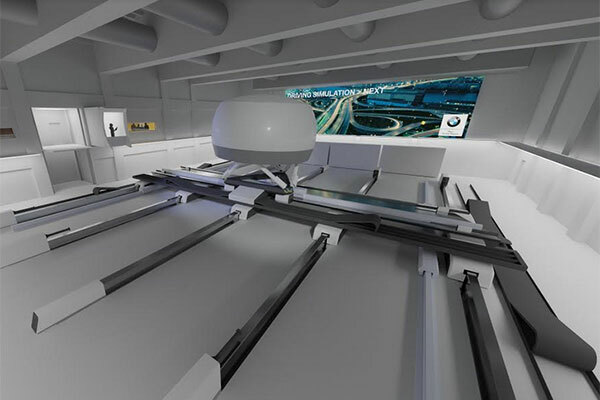 A unique feature of the facility is the high-fidelity simulator, in which longitudinal, transverse and rotational movements of a vehicle can be represented simultaneously and therefore very realistically. The foundation stone for the first phase was laid in autumn 2017 and now the start of work on the new Driving Simulation Centre marks a further stage in the project. It is being built in a central area between the Projekthaus and the Aerodynamic Test Centre. Covering a total floor area of 11,400 sq m, the facility will comprise 14 simulators and usability labs employing 157 people. BMW Group Research is planning to start work here in 2020. The investment in the new Driving Simulation Centre is estimated at around 100 million euros. An extremely detailed rendering of real-world driving characteristics is provided by the second unit, the high-fidelity simulator: braking and accelerating while cornering, driving in roundabouts and rapid series of multiple turn-off manoeuvres can be reproduced with high precision in this simulator’s almost 400-square-metre motion area. This means that, for the first time, complex urban driving situations – which present a particularly wide range of challenges for automated driving systems – can now be replicated under laboratory conditions. In order to establish both the functional reliability of new systems and their usability, the virtual test drives in the new Driving Simulation Centre will be conducted not only by the development engineers and professional test drivers, but also by customers on a regular basis.